The ‘Freedom 251’ mobile priced at a sensational Rs 251 by Ringing Bells company first elicited amazement from all and sundry and then caused consternation to break out as the website freedom251.com crashed after tens of thousands of people tried to log onto the website to book the cheapest smartphone in the world. 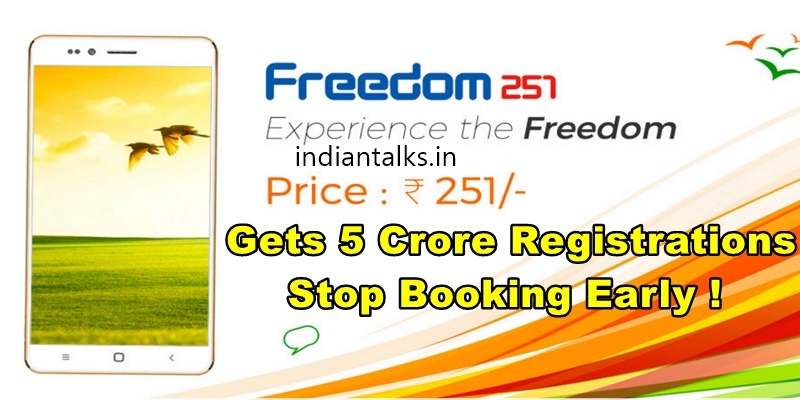 Freedom 251 : The Latest Report says that Ringing Bells claimed to have received nearly 5 crore registrations in just 2 days of opening up for online pre-orders.Ringing Bells president Ashok Chadha stated that the company will hand over 25 lakh ‘Freedom 251’ mobiles to the people who have registered for it online, says report.Established in 2015, Ringing Bells Pvt. Ltd. is one of the fastest growing smartphone company in India. Earlier on Thursday, Ringing Bells claimed to have received 30,000 confirmed orders for the Freedom 251 mobile phone and over six lakh hits per second clicks on its website on the first day. But hours later, the firm stopped taking orders after its servers crashed owing to a huge rush to book the device online.According to reports, government is keeping a close watch on Ringing Bells 4-day booking offer that started from 6 a.m. on Thursday. And that may make the road ahead for the ‘Freedom 251’ tough. Also the Indian Cellular Association has written to the telecom ministry, urging the government to get to the bottom of the issue as selling a smartphone this cheap is not possible.